Throughout my career, I have seen many cases of business and technology challenges within the enterprise IT market being much underserved for years by inadequate products and solutions offered by vendors. This can typically go on for long time, until a new approach arrives and disrupts the market, by offering a significantly better way to solve a problem. Over the past decade, many dynamics and technology innovations have shaped the enterprise IT environment of today, to name a few, consumerization of IT, cloud services becoming ubiquitous, the rise of SaaS, explosive rise in consumer IP traffic and the race for more enterprise apps trying to capture the commercial opportunity. Enterprise networks and data centers today live with one foot on premises and one in the cloud. In fact, 75% of enterprises expect to have ‘hybrid’ cloud deployments by 2015. Networks are going hybrid too, with private MPLS links for mission-critical apps and the public Internet for noncritical traffic. Two years ago, 30% of companies were using an Internet connection in place of a traditional WAN link in at least one location. The number rose to 50% in 2013, and was expected to reach 55% in 2014. It is this combination of private and public assets delivering essential business services that defines the hybrid enterprise. The hybrid enterprise is the new normal. Hybrid architectures and SaaS applications bring obvious benefits—agility/time to market, cost savings, flexibility—but also challenges, such as the complexity of multiple clouds, networks, service providers, and SLAs, plus end users everywhere, and hundreds of applications that need to be managed and delivered across a mix of networks. The companies that not only manage all this new complexity but leverage it to make their applications perform at their peak will gain a competitive advantage in the new hybrid world. To achieve this, CIOs need to ensure that all on-premises, cloud, and SaaS applications perform to the SLAs determined by the business. Over time and in response to this evolution, IT had to react and deal with the problem of managing this changing environment and maintaining a necessary level of control. Monitoring tools were being added to improve and attempt to maintain visibility of networks, applications, servers, databases and infrastructure. The need for multi-domain metrics and data has led to massive proliferation of point solutions within IT for managing performance of applications. So where are we today? Despite an increase in the number of visibility and monitoring tools, IT’s ability to efficiently and effectively manage application performance has, ironically, declined. In a world saturated with point solution offerings for network and application performance monitoring, I am not surprised. IT groups, each with their own tool, behave like the blindfolded technologists ‘touching the elephant’. With incomplete visibility, domain teams ‘see’ different things and only part of the environment that delivers the application to the consumer. Silos, lack of collaboration, and at times ‘warring tribes’ are common. So how do we alter our approach to managing applications in order to make it more efficient and responsive? We need to find a way to manage performance issues proactively before users notice and before they negatively impact the business. To enable this, we need to be able to look at performance issues holistically and to collaborate across domains. Finally, we need to reduce the amount of time and effort we spend firefighting so that IT can deliver strategically important projects. 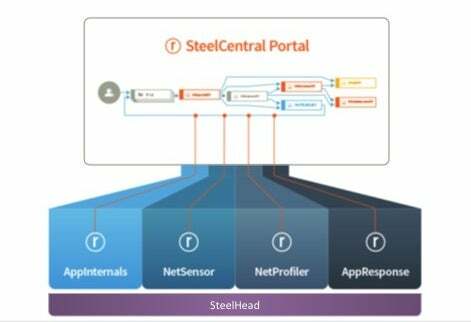 Today, at Riverbed, we are excited to announce SteelCentral Portal, a disruptive and breakthrough solution for managing application performance in today’s hybrid environments. With this solution, companies are able to replace the finger-pointing blame game of the war room with a new approach: a holistic operational view of application performance, for any type of application, from the end-user, through the network and infrastructure over which it runs, and deep into the actual application components and code. The solution blends data from Riverbed’s industry-leading visibility tools: SteelCentral AppInternals and AppResponse for APM data, NetProfiler and NetSensor for NPM data, and SteelHead for additional performance telemetry. SteelCentral Portal uniquely integrates this cross-domain data to create a dynamic map of application performance. Different teams can get a complete picture of the application environment at any level, which helps to more rapidly diagnose and fix service issues. Establish an actionable performance-reporting environment that empowers domain specialists and line of business generalists alike.